Addonics introduced the External CipherChain, a product that offers hardware encryption for just about any eSATA or SATA storage device. 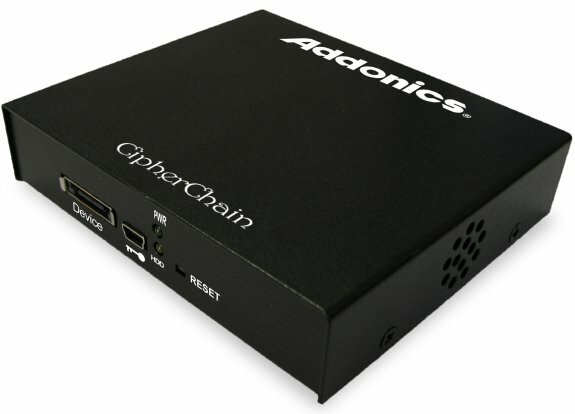 Addonics Technologies, (www.addonics.com) today announced the External CipherChain, a full disk hardware encryption product that lets users encrypt just about any external data storage device with eSATA or SATA connection - from sensitive data on external RAID storage devices to external hard drives, Solid State Drives (SSDs), and many popular flash media. The External CipherChain's 256-bit encryption is considered the highest level of encryption, secure enough to protect classified information designated as "Top Secret". The full disk encryption encrypts the boot sector, partition table and all the information in the drive. If the encrypted external drive is stolen, the drive will appear as a brand new drive with no trace of any data.